Today's project is a favor that I made for our son and daughter-in-law's rehearsal dinner last month. It's been a crazy time, so I am just now getting to post it. I used the Frosted Floral Specialty Designer Paper and the Duet Banner Punch along with the Thoughtful Banners stamp set. Inside the box is an individually wrapped brownie-YUM! I hope you are inspired today! Please let me know if you have any questions about any of my cards or projects. 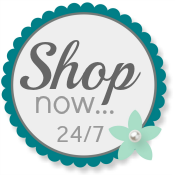 Use my Online Store any time you want to order Stampin' Up! Products. Please check out the Annual Catalog Retiring Items List! If there is a product you want, I recommend buying it right away and not waiting to see if it’s discounted later or you risk it being sold out.